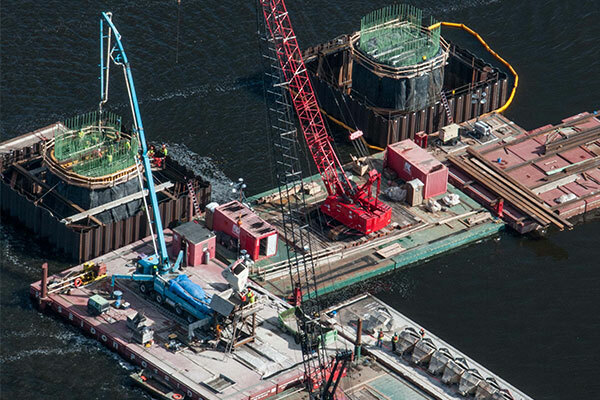 Kraemer constructed five river piers and foundations for the new St. Croix River extradosed bridge, and developed an innovative precast cofferdam design by integrating elements of a traditional and deep water precast cofferdam. The hybrid substantially reduced the depth of the seals needed for the cofferdam. This allowed Kraemer to install sheet pile directly onto the precast floor while above water, which reduced impacts to the river bottom and water clarity by eliminating vibratory hammer pile driving. This innovation reduced the amount of excavation to be treated and disposed by more than 8,800 CY. The project won two innovation awards from the Minnesota Erosion Control Agency for the dewatering system and project erosion control measures. Kraemer faced challenging river conditions with a late ice out and a late summer high water event, yet still completed the project four months ahead of schedule.